CARBONDALE, Ill. — A man remembered for his deep commitment to SIU Carbondale students will continue to have an influence on the lives of young people in the College of Agricultural Sciences. Walter J. Wills, professor emeritus of agricultural economics, bequeathed more than $1 million to the University’s College of Agricultural Sciences. This gift will support various areas within the College of Agricultural Sciences and endow scholarships according to the specifications and wishes of the estate. Students who major in Animal Science, Plant & Soil Science, Ag Mechanization, and Agribusiness Economics will benefit from these scholarships. 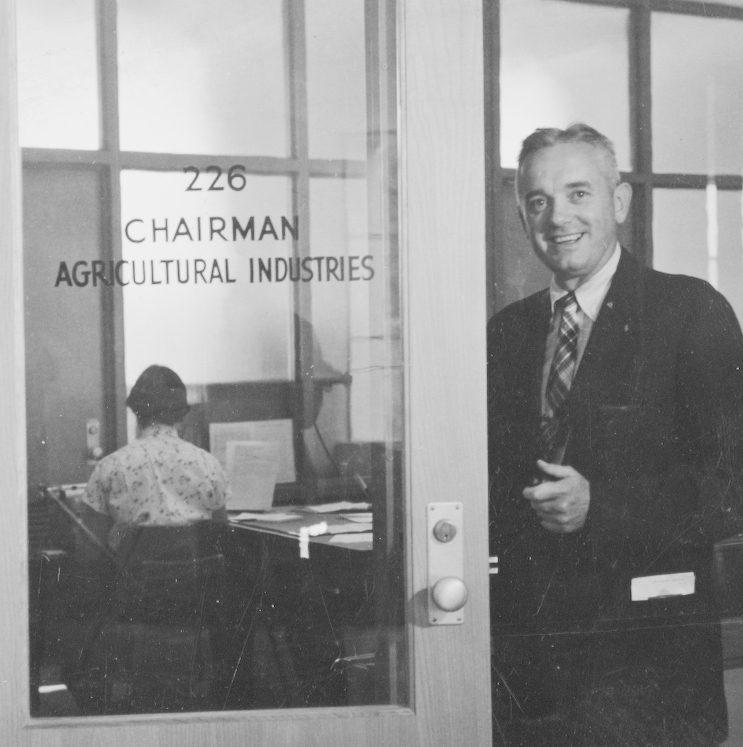 Wills was hired in 1956, just a year after the University established its College of Agriculture. He chaired the agricultural industries department for 15 years and served the University for 27 years until his retirement in 1983. Wills was also a veteran, having served as an Army lieutenant during World War II. He served in the 3rd Army under General Patton. The Beecher City, Ill., native was a member of the First Christian Church and Carbondale Rotary. He died in 2000 at the age of 84. Gary Minish, dean of the College of Agricultural Sciences, says Wills’ gift is significant and will provide educational opportunities for students who might not have been able to attend or afford college. Scates, who was a student during the early years of the agricultural college, says he also admired Wills for his continued interest in students once they graduated. Dr. William Herr, who Wills hired onto Southern’s College of Agriculture faculty in 1957, concurs with Scates’ assessment. Herr also complimented Wills for serving as an ambassador during the early years of the College. “He always enjoyed any opportunity to promote the University,” Herr says. “SIU was trying to make its presence known around the state during those early years. Dr. Wills did everything he could to help. CARBONDALE, Ill. — Hino Motor Sales, USA, a Toyota Group Company, is helping students in Southern Illinois University Carbondale’s Department of Automotive Technology continue their career preparations with advanced technology. Hino, Toyota’s medium duty diesel truck division, today (Sept. 15) delivered a 2005 electronic diesel fuel injection cab and chassis to the nationally recognized program. The 2005 MY 338 T Class 7 series truck will provide students in the senior-level alternative fuels class a first-hand look at some of the newest technology available, said Jack S. Greer, who chairs the automotive technology department. Dan Corey, a technical service manager with Hino Trucks and a two-degree graduate of SIUC, coordinated the donation. He earned a bachelor’s degree in automotive technology in 2000, and a master’s of education in the Workforce Education and Development program in 2002. The six-cylinder diesel engine with computer-controlled technology will enable expansion of the diesel fuels portion of the alternative fuels class, and offer students a chance to see things they would not have normally seen, said Blaine M. Heisner, an assistant instructor in automotive technology. Utilizing the equipment in the classroom reduces the need for later on-the-job training, Heisner said. Terry A. Owens, interim dean of the College of Applied Sciences and Arts, is pleased with the donation. “These are exciting times for the Automotive Technology program,” Owens said. “Obviously, we are very excited about the approval of the capital bill and eagerly await the release of funds by the governor for construction of the Transportation Education Center. In advance of the opportunity to move into a new facility befitting the Automotive Technology program’s national recognition and reputation, enrollment is at an all-time high. 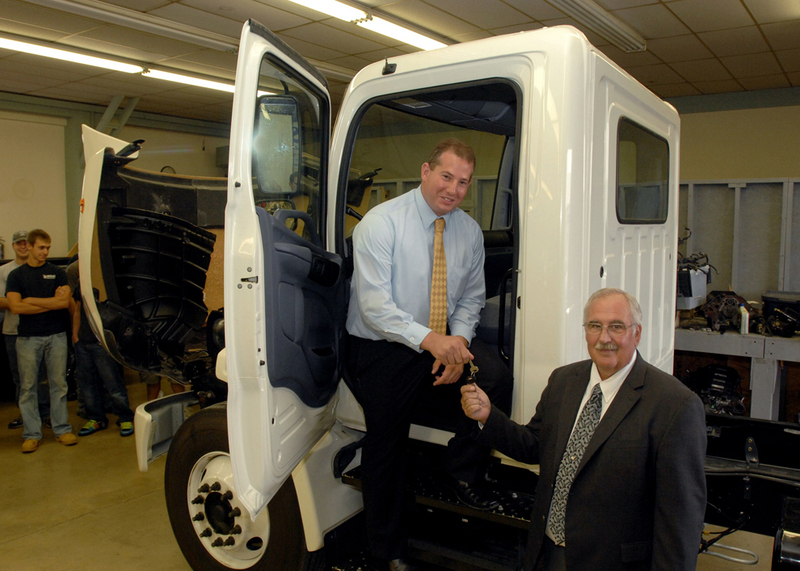 “We greatly appreciate the efforts of our alum, Mr. Dan Corey, and the generosity of Hino Trucks. This is another example of the importance of the Automotive Technology program to the industry,” Owens said. The estimated 249,016-square-foot Transportation Education Center, or TEC, will house the aviation and automotive technology programs at the Southern Illinois Airport. Gov. Pat Quinn signed a statewide capital construction plan this summer, but the $62,830,800 project awaits funding release. The construction project should take two years to complete. Facilities on the University’s campus in Carterville have housed the automotive technology program since its inception in 1952. The vehicle is the company’s largest truck, and features a 3000 series Allison transmission, full air ABS brake system and axles by Arvin Meritor, and Hendrickson full air suspension, Corey said. Manufactured in the company’s West Virginia assembly plant, the trucks use about 95 percent American-made components; only the cab and diesel engine come from Japan, Corey said. The donation is valued at about $70,000, Greer said. Such a purchase would be cost-prohibitive for the department, Heisner noted. “Having donations like this and the alumni supporting our program as they do keeps our program where we are,” Greer said. Corey said there are two primary reasons behind the donation. “The automotive program at SIUC has given my career along with so many others a boost that I, on behalf of Hino, wanted to give back to the program a tool that will help students achieve their academic and career goals,” Corey said. A second reason is the dramatic change in federal emissions regulations on diesel truck engines over the past five to 10 years. Experts predict technological advancements mean that air going into diesel engines will be cleaner as it exits the tail pipe than before entering the engine. Greer is pleased with the program’s continuing success. Enrollment for the fall 2009 semester is 210 students on the SIUC campus, an all-time high in the program’s 57-year history. The program is offering night sections to accommodate its students and is “busting at the seams,” Greer said. Reductions in the automotive industry are primarily on the manufacturing side and not the service side, Greer said, noting that aftermarket parts manufacturers and retail automotive service centers also provide important job opportunities. The program also operates an off-campus program at Harry S. Truman College in Chicago that began in fall 2007, with 19 more students enrolled. The off-campus program provides Chicago-area students the opportunity to obtain a bachelor’s degree in automotive technology. Students complete an associate of applied science degree from Kennedy-King or Truman College, and then transfer into the automotive technology program, where SIUC faculty teach upper-level automotive technical and automotive management courses at Truman College. In 2005, the program earned the Automotive Industry Planning Council’s Award of Excellence — marking a third time as the nation’s top automotive program. The program also earned top honors in 1991 and 1999.